We trust it may not be deemed out of place if we venture to offer a word of counsel and encouragement to all who have been and are engaged in the blessed work of preaching the gospel of the grace of God. We are, in some measure, aware of the difficulties and discouragements which attend upon the path of every evangelist, whatever may be his sphere of labor or measure of gift; and it is our heart's desire to hold up the hands and cheer the hearts of all who may be in danger of falling under the depressing power of these things. We increasingly feel the immense importance of an earnest, fervent gospel testimony everywhere; and we dread exceedingly any falling off therein. We are imperatively called to "do the work of an evangelist", and not to be moved from that work by any arguments or considerations whatsoever. Let none imagine that, in writing thus, we mean to detract, in the smallest degree, from the value of teaching, lecturing, or exhortation. Nothing is further from our thoughts. "These things ought ye to have done, and not to leave the other undone". We mean not to compare the work of the evangelist with that of the teacher, or to exalt the former at the expense of the latter. Each has its own proper place, its own distinctive interest and importance. But is there not a danger, on the other hand, of the evangelist abandoning his own precious work in order to give himself to the work of teaching and lecturing? Is there not a danger of the evangelist becoming merged in the teacher? We fear there is; and it is under the influence of this very fear that we pen these few lines. We observe, with deep concern, some who were once known amongst us as earnest and eminently successful evangelists, now almost wholly abandoning their work and becoming teachers and lecturers. This is most deplorable. We really want evangelists. A true evangelist is almost as great a rarity as a true pastor. Alas! alas! how rare are both! The two are closely connected. The evangelist gathers the sheep; the pastor feeds and cares for them. The work of each lies very near the heart of Christ  the Divine Evangelist and Pastor; but it is with the former we have now more immediately to do  to encourage him in his work, and to warn him against the temptation to turn aside from it. We cannot afford to lose a single ambassador just now, or to have a single preacher silent. We are perfectly aware of the fact that there is in some quarters a strong tendency to throw cold water upon the work of evangelization. There is a sad lack of sympathy with the preacher of the gospel; and, as a necessary consequence, of active co-operation with him in his work. 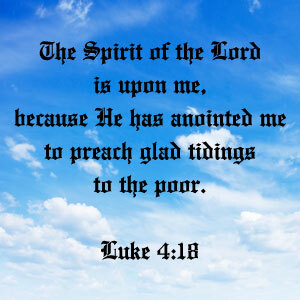 Further, there is a mode of speaking of gospel preaching which argues but little sympathy with the heart of Him who wept over impenitent sinners, and who could say, at the very opening of His blessed ministry, "The Spirit of the Lord is upon Me, because He hath anointed Me to preach the gospel to the poor" (Isaiah 61:1; Luke 4:18). And again, "Let us go into the next towns, that I may preach there also: for therefore came I forth" (Mark 1:38). Our blessed Lord was an indefatigable preacher of the gospel, and all who are filled with His mind and spirit will take a lively interest in the work of all those who are seeking in their feeble measure to do the same. This interest will be evinced, not only by earnest prayer for the divine blessing upon the work, but also by diligent and persevering efforts to get immortal souls under the sound of the gospel. This is the way to help the evangelist, and this way lies open to every member of the Church of God  man, woman, or child. All can thus help forward the glorious work of evangelization. If each member of the assembly were to work diligently and prayerfully in this way, how different would it be with the Lord's dear servants who are seeking to make known the unsearchable riches of Christ. But, alas! how often is it otherwise. How often do we hear even those who are of some repute for intelligence and spirituality, when referring to meetings for gospel testimony, say, "Oh, I am not going there; it is only the gospel". Think of that! "Only the gospel". If they would put the idea into other words, they might say, "It is only the heart of God  only the precious blood of Christ  only the glorious record of the Holy Ghost". This would be putting the thing plainly. Nothing is more sad than to hear professing Christians speak in this way. It proves too clearly that their souls are very far away from the heart of Jesus. We have invariably found that those who think and speak slightingly of the work of the evangelist are persons of very little spirituality; and on the other hand, the most devoted, the most true hearted, the best taught saints of God, are always sure to take a profound interest in that work. How could it be otherwise? Does not the voice of Holy Scripture bear the clearest testimony to the fact of the interest of the Trinity in the work of the gospel? Most assuredly it does. Who first preached the gospel? Who was the first herald of salvation? Who first announced the good news of the bruised Seed of the woman? The Lord God Himself, in the garden of Eden. This is a telling fact in connection with our theme. And further, let us ask, who was the most earnest, laborious, and faithful preacher that ever trod this earth? The Son of God. And who has been preaching the gospel for the last eighteen centuries? The Holy Ghost sent down from heaven. Thus then we have the Father, the Son, and the Holy Ghost all actually engaged in the work of evangelization; and if this be so, who are we to dare to speak slightingly of such a work? Nay, rather may our whole moral being be stirred by the power of the Spirit of God so that we may be able to add our fervent and deep Amen to those precious words of inspiration, "How beautiful are the feet of them that preach the gospel of peace, and bring glad tidings of good things!" (Isaiah 52:7; Romans 10:15). But it may be that these lines shall be scanned by some one who has been engaged in the work of preaching the gospel, and is beginning to feel rather discouraged. It may be that he has been called to preach in the same place for years, and he feels burdened by the thought of having to address the same audience, on the same subject, week after week, month after month, year after year. He may feel at a loss for something new, something fresh, some variety. He may sigh for some new sphere, where the subjects which are familiar to him will be new to the people. Or, if this cannot be, he may feel led to substitute lectures and expositions for the fervid, pointed, earnest preaching of the gospel. If we have in any measure set forth the reader's feelings on this subject, we think it will greatly help him in his work to bear in mind that the one grand theme of the true evangelist is Christ. The power to handle that theme is the Holy Ghost. The one to whom that theme is to be unfolded is the poor lost sinner. Now, Christ is ever new; the power of the Holy Ghost is ever fresh; the soul's condition and destiny ever intensely interesting. Furthermore, it is well for the evangelist to bear in mind, on every fresh occasion of rising to preach, that his unconverted hearers are totally ignorant of the gospel, and hence he should preach as though it were the first time they had ever heard the message, and the first time he had ever delivered it. For, be it remembered, the preaching of the gospel, in the divine acceptation of the phrase, is not a mere barren statement of evangelical doctrine  a certain form of words enunciated over and over again in wearisome routine. Far, very far from it. The gospel is really the large loving heart of God welling up and flowing forth toward the poor lost sinner in streams of life and salvation. It is the presentation of the atoning death and glorious resurrection of the Son of God; and all this in the present energy, glow, and freshness of the Holy Ghost, from the exhaustless mine of Holy Scripture. Moreover, the one absorbing object of the preacher is to win souls for Christ, to the glory of God. For this he labors and pleads; for this he prays, weeps, and agonizes; for this he thunders, appeals, and grapples with the heart and conscience of his hearer. His object is not to teach doctrines, though doctrines may be taught; his object is not to expound Scripture, though Scripture may be expounded. These things lie within the range of the teacher or lecturer; but let it never be forgotten, the preacher's object is to bring the Saviour and the sinner together  to win souls to Christ. May God by His Spirit keep these things ever before our hearts, so that we may have a deeper interest in the glorious work of evangelization! We would, in conclusion, merely add a word of exhortation in reference to the Lord's Day evening. We would, in all affection, say to our beloved and honored fellow-laborers, Seek to give that one hour to the great business of the soul's salvation. There are 168 hours in the week, and, surely, it is the least we may devote one of these to this momentous work. It so happens that during that interesting hour we can get the ear of our fellow-sinner. Oh, let us use it to pour in the sweet story of God's free love and of Christ's full salvation. From Papers on Evangelization, chapter 1.